Mention White’s, Boodle’s or Brooks’s in a story and my ears perk up. At once I picture staid facades hiding smoke-filled rooms and intrigue amid expensive carpets, wallpapers, and leather and mahogany furniture. When I read of Mr. Darcy being offered a cigar or glass of brandy, or having supper whilst talking business with his contemporaries, it is equivalent to reading about 007 holding forth in a casino. Yes, my Mr. Darcy is right up there with Ian Fleming’s hero, and it is no great leap to imagine Darcy dressed to the nines and turning heads—men’s as well as women’s. After all, Beau Brummel’s fashionable clothes influenced his contemporaries, so they must have been paying attention. How did men about town spend their time before these three became the clubs of choice in London? I suppose we shall never know the answer to that question, but I would like to share some of what I learned about the haunts of the elite (at least the men) in the Regency era. Gentlemen’s clubs were for amusement, politics, and play, and not the matter-of-fact meeting places of general society.These interior pictures are of Brooks. I have included them because this is how I imagine a proper gentlemen’s club should look. 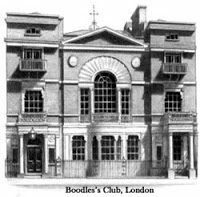 Keep in mind that there were many other less notable clubs during the Regency and much more information available than I could share here. During the Regency era, it was known as the club of the English gentry, while White’s became the club of the more senior members of the nobility. It has never been identified with politics and it was reputed that Beau Brummell’s last bet took place at the club before he fled the country to France. 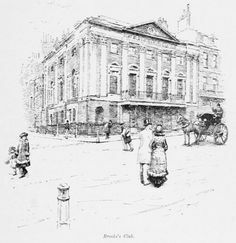 Brooks’s pre-eminently the clubhouse of the Whig aristocracy, occupies 60 St. James Street. William Brooks, a wine merchant and money lender who acted as manager for Almack’s, had the clubhouse constructed. Paid for at Brooks’s own expense, the building was completed in October 1778, and all members of Almack’s were invited to join (well, all the men). Brooks’s gamble paid off, as the existing members swiftly moved into the new building and the club then took Brooks’s name. “Ld. Cholmondeley has given two guineas to Ld. Derby, to receive 500 Gs whenever his lordship (Use your imagination here. I had no idea they used that word back then!) a woman in a balloon one thousand yards from the Earth.” There is no indication that the bet was ever paid and I have to wonder how they would have checked the validity of the bet had it been claimed! 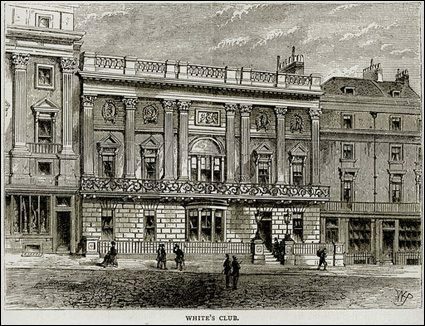 White’s, the great Tory club, located at 37 St James’s Street, London, is the oldest and most exclusive gentleman’s club in the city. It began in 1693 as a chocolate shop established in Mayfair, by an Italian immigrant named Francesco Bianco. The hot chocolate emporium went under the name Mrs. White’s Chocolate House and from it tickets were sold to the productions at King’s Theatre and Royal Drury Lane Theatre as a side-business. By the early 18th century, however, it had transitioned from chocolate shop to an exclusive gambling house where fortunes were won and lost. 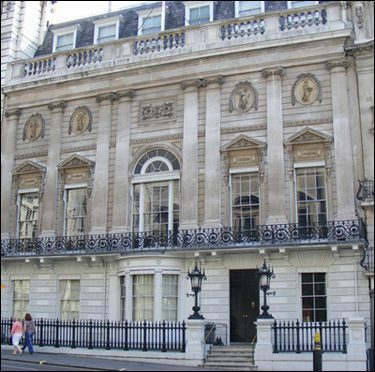 Those frequenting it were known as “the gamesters of White’s” and Jonathan Swift once referred to the club as the “bane of half the English nobility.” Moreover, White’s is famous for having a bow window on the ground floor where Beau Brummell ruled until he left for the Continent in 1816. Fogeydom? What a sad picture of the White’s I love to write about in my tales. 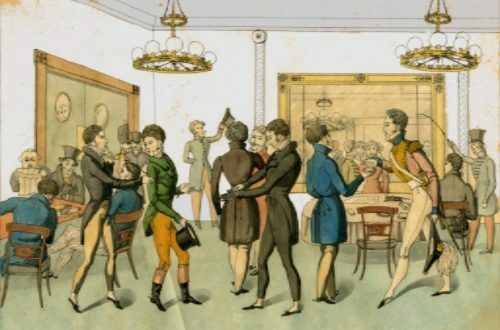 I hope you enjoyed seeing actual pictures of the three most popular gentlemen’s clubs in the Regency era (then and now) and learning a bit about them. Do you have a favorite? I love these places! I think my favorite is Brooks’, because it looks like a mini-country house. It would do very nicely as my place in London! Now what I really want to know, since it was a Men’s Only”, were they serviced exclusively by men? Did they possibly have women clean in the off hours? I’m curious because it would be so fun to have a little gossip among the women about what really went on. Then again, I supposed the wives of the men who attended may have gossiped over what their husbands repeated, intentionally or not. LOL. I loved the pictures and yes, I can hear the bond music playing as Darcy walks in wearing his dark suit with his immaculate white shirt and fashionably tied cravat. He hands his hat, gloves & walking stick to the footman and voila! Great fun! Thanks, Brenda. Oh Yes, now I remember. I loved that series. The visual of the food was awesome! As usual, a fascinating post on social history in Regency times, Brenda. I would imagine that the walls of the rooms at these clubs would become quite dark due to all of the cigar smoke. My Dad was a heavy smoker of cigarettes and had to redecorate the living room at home every three or four years, so I imagine a large number of gentlemen smoking cigars would do something similar. Personally, I thank goodness for the public smoking ban we have in the UK. It makes a trip to the pub or a restaurant a much pleasanter experience. Do you have one in the USA? Or would it be one of those things done at a state level? I had not thought of that Anji, but you are SO right! I have been the homes of those who smoke a lot and the walls are yellow with nicotine. I can only imagine, too, that many of them died from ingesting second hand (if not first hand) smoke, Sad really. Yes, we do have bans on smoking in a lot of our cities (in public places) but, unfortunately, not all. My son lives in Nashville, TN and he complains about the smoke since he has allergies and some asthma. I believe the “country music” industry forwards the idea of “good ole boys” who smoke. So sweet of you to say Joana. 🙂 I really enjoy the historic part of writing stories and there is so much to learn and use in our stories. I am hopeful that someone will read something they didn’t know about in my posts. Thank you for always taking the time to comment, girl. Hugs. Man caves!!! You are absolutely correct Carmalee. Heh heh. Boodles is not the name I would have chosen either. Thanks for taking time to comment. Quite interesting article. I sort of pictured it as such as I read novels. Reading newspapers, smoking cigars, betting on whose getting married, etc. Thanks for the article and photographs. You and me both MaryAnn. I can smell the cigar smoke as I write!!! You’re welcome. I love history so this is right up my road! Just so very interesting. Mine, too, Stephanie! I’m glad you found it interesting. You are right about great minds Regina! I loved the link to your information too. Thanks for sharing. Oddly, Carylkane it put my reply at the top of the comments. Weird. This was fascinating. Thank you so much for sharing. I love the interior pictures.